Movie Review - 'Moonrise Kingdom' Wes Anderson's latest film is the story of a 12-year-old girl and boy who merge their imaginative worlds on an island off the coast of New England. 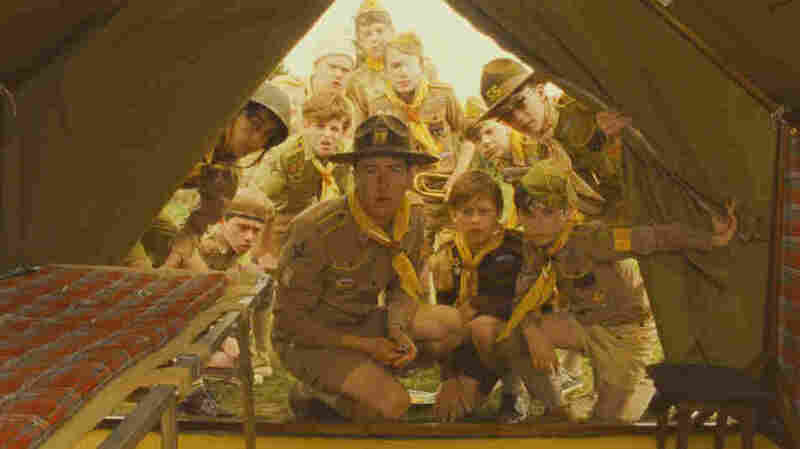 Critic David Edelstein says Moonrise Kingdom will appeal to Anderson's longtime fans as well as anyone who appreciates good cinematography and design. Many people are rapturous over the work of Wes Anderson, and for them, I expect, Moonrise Kingdom will be nirvana. The frames are quasi-symmetrical: a strong center, often human, with misaligned objects on each side suggesting a universe that's slightly out of balance, like a series of discombobulated dollhouses. The movie is a Platonic romance set on an island off the coast of New England, the story of a 12-year-old girl and boy who merge their imaginative worlds. In an overture, the camera pans left to right past a series of stylized rooms in the beach house of the girl, Suzy, played by Kara Hayward. The camera lingers on an impressionistic needlepoint of a similar house — and a short time later when Suzy stares through binoculars out a window, it zooms out to show she's inside the house in that needlepoint. Pretty cool, huh? So the whole movie is, like, this big, self-referential art object. You could even interpret the action as unfolding in the mind of its feverishly creative boy protagonist, Sam, played by Jared Gilman, a bespectacled orphan on a Scout trip with boys who relentlessly bully him. At the start of the film, Sam has escaped from the camp, leaving the hapless but sweet scoutmaster played by Edward Norton to exclaim, "Jiminy Cricket, he flew the coop!" Soon it's clear that Sam and Suzy are making their way toward each other across the island — with the party-pooper grown-ups in pursuit. As in Anderson's other films, these are parents who can't parent. Sam's foster father tells the sheriff, played by Bruce Willis, that when he finds Sam he doesn't want him back. Suzy's parents are present but still absent. She spies her mother, played by Frances McDormand, meeting in secret with Willis' sheriff while her father, played by Bill Murray, is off somewhere in his own world. When Suzy and Sam meet, she tells him she wishes she were an orphan, too, like the heroes in her magical storybooks. Sam brushes her off, saying he loves her but doesn't know what she's talking about. He wouldn't wish his orphaned existence on anyone. The script of Moonrise Kingdom was co-written with Roman Coppola and is nearly as stylized as the movie's look, full of absurdist curlicues delivered deadpan. I wish that Moonrise Kingdom were as much of a showcase for the performers as it is for the cinematographer and designers, but this is stand-in-your-place-and-say-your-lines acting, the stars essentially donating their likable selves for a higher cause — although Bill Murray has a few affecting moments when his character is in the throes of self-pity. The kid stars in their film debuts are fine — Jared Gilman behind glasses that take up almost half his face, Kara Hayward behind eyes onto which her character has glopped on a load of mascara. Moonrise Kingdom carries a prominent dedication to Anderson's girlfriend, writer Juman Malouf, and it feels like a wedding present from one artistic soul to another. It's a deeply heartfelt work, yet unlike Anderson's fans at this year's Cannes Film Festival, I was never carried away by it — it kept me at arm's length, more bemused than exhilarated. At several points, the soundtrack features a recording of Benjamin Britten's The Young Person's Guide to the Orchestra, in which the instruments are presented together and singly. I'm guessing it's there because Anderson wants us to know how much he loves taking things apart and re-arranging them, that what seems to some people — like me — fussy, even twee, is to others exquisite and moving. Moonrise Kingdom will divide people the way Anderson's other films, do. But we can all agree that it's an object of beauty.